jeepers creepers, what's happened to brogues? The much-loved Brogue shoes have had a bit of a redesign! But is the change a bit too much? 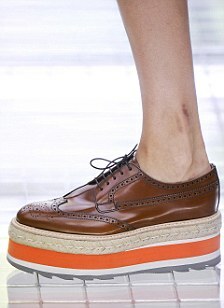 Prada have designed some new 'creeper brogues' for their SS11 collection, with a nice £510 price tag... The media's going insane over them right now, but personally I'm not that keen on them. I can't see myself wearing these shoes. Mixing brogues with espadrilles (and even being classed as a trainer too) is just too much for me to handle! I don't think they look as smart and classic as the original brogues... I do love the bright coloured sole though. I've had a bit of a hunt to see what the high street have came up with... Not as extreme as Prada, so my opinion of them is a bit more positive now. Time for some skin, hand&nail care reviews!